Western publics gulled into war in which everyone loses. I promised a blog about Trump’s two summits, the one with NATO leaders and the other, with Putin in Helsinki. I also promised that after Helsinki, I would comment at greater length on the Russia, Israel and USA triangular relationship in the context of the Middle East. However so much, of much greater import has happened post-Helsinki, that the Middle East will have to wait for another blog. The outcome of the NATO meeting, in contrast to Helsinki, was largely predictable. Trump has previously and on many occasions, made his position completely clear; he has no time for multinational organisations and nothing but contempt for leaders, who would prefer to rely on others to look after their countries’ interests. 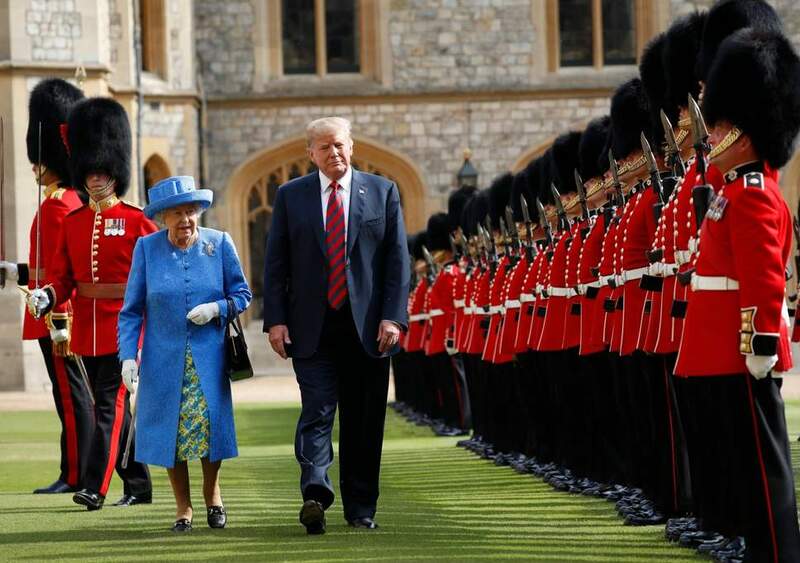 Looking at the post-NATO summit TV footage of Trump pursued by HM The Queen, as he reviewed the bear-skinned guard of honour, one couldn’t help but feel that the bully in him was positively enjoying tweaking the noses of the decrepit lion and its monarch, a 90-year old lady! I am not claiming that this is all deliberate and targeted policy on Trump’s behalf. It could well be a by-product of his undeniable and, in the longer-term, certain to be unsuccessful attempts to ‘make America great again.’ It seems increasingly likely that by entering into economic competition with his European allies, Trump will so unsettle the assorted sycophants, compradors and political dependents, that they will change their policies in directions that makes the continuation of the US establishment’s current cold/hot war preparations against Russia no longer feasible. Such an outcome should only be welcomed. The Europeans will then have to work out for themselves how they will avoid being invaded and crushed by a country with an economy smaller than Italy’s. Most significantly, and no doubt offering false encouragement to Washington’s hawks that their strategy is on the brink of success, in contrast to NATO’s, Russia’s defence budget is being reduced. (2.) In his comments, Jens Stoltenberg, NATO’s Secretary General, is clearly attempting to preempt Trump’s demand for higher defence expenditure that the Europeans knew was going to come and signalling to the Washington hawks that the European end of NATO was not fully on side. Unsurprisingly, being that much closer to the action, the Europeans are not as blind to history, as the US appears to be. Russia, having saved Europe from the Nazis was totally depleted and had no urge, capability, or incentive to invade Western Europe once it had secured itself against any possibility of a renewed assault from the West. Instead of thanking Russia and help it get back on its feet again, the USA abetted by the UK and waving their nuclear monopoly, did all in their power to ensure that Russia had no reason to feel that security. NATO has pursued that same policy ever since, while, rejecting Gorbachev’s overtures to integrate with Western Europe after Russia had overthrown its communist dictatorship. Same old, same old – until now! Maverick Trump has come along from outside the Council on Foreign Relations matrix and started asking questions no previous presidents have dared to ask. 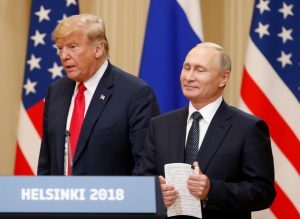 Politics being the art of the possible, the post-Helsinki furore created by the Russophobes and Trump’s enforced public back-tracking has made obvious the disparity between what Trump actually thinks and what the pressures of domestic politics at home force him to say. I have to admit that I am bemused by the readiness with which the mainstream western media and with it the western publics, so eagerly ingest the Russophobic slavering that is being spat in their faces. You would think that anyone interested in the matter could soon see that Donald Trump is trying to defuse the increasingly dangerous and irrational tensions between the West’s war parties and their Russian targets. But that is not the case. 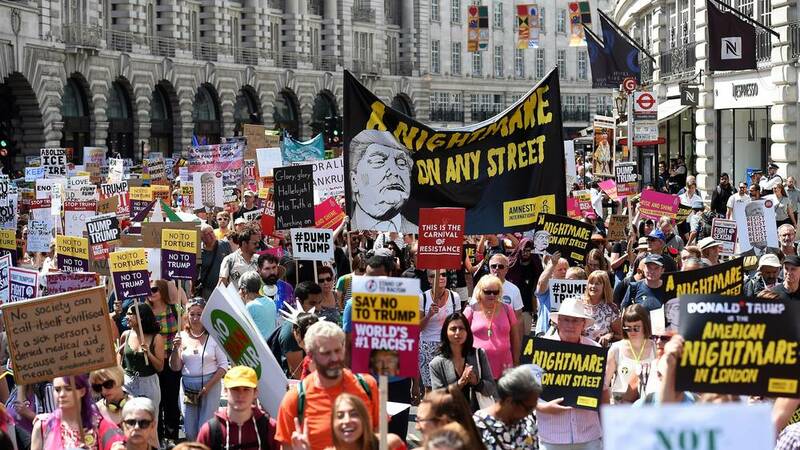 Western streets are filled with marchers protesting against Trump’s multiple, and deplorable, anti-‘liberal’ positions on matters such as immigration and climate change. However, laudable liberal sentiment provides only a front for these protests. Were this in the USA, these would be lemmings headed for the nuclear cliff. Here, in London,, they might just contribute to the break-up of NATO and increase their chances of avoiding a holocaust. In effect, the deluded crowds are shouting for their own destruction. Behind the self-virtuous mobs, are the profiteering manipulators of power and privilege. Now that Trump and Putin between them, have effectively neutered the global terrorism that served so well as the neo-cons’ stalking-horse, the pro-war party is urgently pressing for the most dangerous phase of the cold war to be wheeled back onto centre-stage. With communism no longer a viable target and Russian democracy not sufficiently dissimilar from the USA’s own dictocracy, the hostility has to be channeled ad hominem towards the Russian president himself. Establishment advocates of the enhanced cold war, such as in the Council on Foreign Relations’ mouthpiece ‘Foreign Policy Magazine,’ are not in the least abashed in revealing not only that they are seeking regime change in Russia, but also the purely mercenary motives behind their assault. (4.) 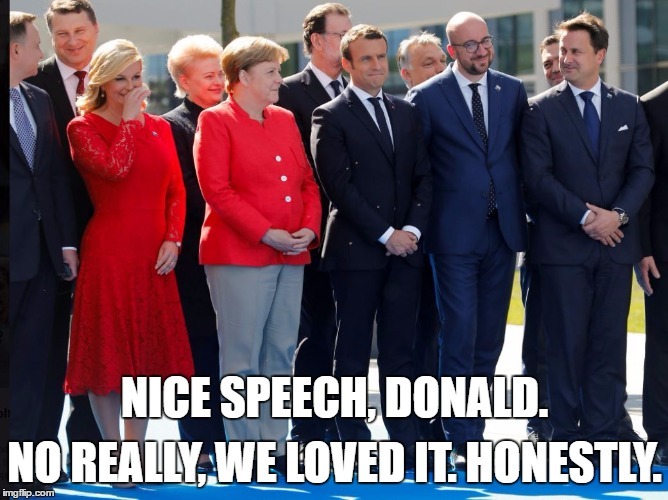 If they believe the western European allies will fall for such US-centric self-seeking policies, their contempt for their spineless allies must be extreme. Like an abused wife, the more they are beaten, the more they cling! The triumph of the war-party’s partisanship over their common-sense has become so disproportionate, that they would rather risk human extinction than release the self-serving, ‘patriotic’ bees from their bonnets. No one should be surprised if another false flag is raised. Were I sitting in the CIA’s black-ops chair, I think my pick of the several choices open to me would be an outrage against some Russian speaking citizens of one of the Baltic states, so as to force Putin to come to their defence. The young warriors in the agencies’ psyops departments are no doubt, having fun as they invent one preposterous story on top of another to feed to the media – and for the career-mindful, debt -enslaved individual journalists, in their turn, to feed to the gulls. They probably don’t foresee, or possibly don’t care, about the likely ultimate fate of a nuclear-armed democracy in which the voters are fed a continuous diet of paranoia and misinformation. The entire Russia-gate hullabaloo has so far seen no credible evidence produced that would withstand proper scrutiny. That is not to say such a thing never happened, but, even if it did, when compared to say Israeli intervention in the same election, it would have been on a minor and ineffective scale, or else the evidence would have been easier to come by. In any case, compared to the USA’s extensive regime change ‘colour-revolution’ operations in Russia and elsewhere (6) any Russian endeavour to meddle, would pale into total insignificance. The increasingly imaginative and likewise unsubstantiated stories around the Skripal incident are full of equally far-fetched, but diplomatically consequential allegations. The Syrian regime’s alleged use of Sarin in an attack on Douma, subsequently proven by the OPCW inspectorate to be a US intelligence generated lie, was yet another attempt by the USA’s war-party to prevent the onslaught of peace. All the above illustrate the apparent impunity with which the western media can and do deliberately manipulate the public to support unjustified and destabilising preparations for war. While it is the media that ensures public acceptance of war preparations, it is the direct interventions and approaches to politicians by lobbyists and ambitious public officials that put these policies in place. These two articles give an excellent introduction to the wheels operating within the wheels of events such as the Helsinki summit! (7.) If an individual lobbyist can achieve Browder’s level of influence over US policy – think what an industry, such as defence or big oil can achieve! The influence of banking is working in an altogether different direction, looking out for its global, as opposed to its purely national interest. More of that in a later blog. I have been catching some flak for my position on the Helsinki Summit. (Each day since the summit the hysterical clamour of America’s under-instruction, Russophobic media grows louder.) In my defence I quote in full an article by John Hallam, an eccentric, who is so out-of-step with American public opinion that he actually welcomes Trump’s and Putin’s attempt to defuse the risk of a nuclear exchange! John quotes verbatim from Trump’s and Putin’s words. How many Khakispecs readers have spotted the same comments reported in their media? CAN WE HAVE MORE ‘ TREASON SUMMITS’ , PLEASE? The significance of a few Russian bots on Facebook, whose final effect on an election outcome we are not even sure of, or even some of Putin’s actual crimes against humanity pales into complete insignificance in the light of a meeting that could have taken the prospect of global annihilation off the worlds agenda. Trump was right to say prior to the summit that his ‘dream’ outcome for the meeting could be peace and the complete abolition of nuclear weapons. To want that is far from ‘treason’. Or if it IS ‘treason’ we need more of it. “…But our relationship has never been worse than it is now. However, that changed, as of about four hours ago. I really believe that. Nothing would be easier politically than to refuse to meet, to refuse to engage, but that would not accomplish anything. It rather looks, to use Trumps words, as if some critics of the summit are ‘risking peace in the pursuit of politics’. If to take a political risk in the pursuit of peace is ‘treason’, please let us have more of it – a lot lot more of it – and please let us have systematic follow-through. Trump in addition at one point (not in the transcript) remarked that the US had ‘made mistakes’ in its relationship with Russia. Trump is merely saying it like it is (and only says a tenth of it). He has been damned for ‘treason’ for saying this. Please lets have more of this kind of ‘treason’ otherwise known as honesty! –A planned series of meetings in which matters of nuclear strategic stability are uppermost and in which discussions of electoral interference are off-limits. –The creation of a joint task force on the complete abolition of US and Russian nuclear arsenals. ‘Treason’ of this kind could just save humans and human civilization from nuclear destruction. The prescriptions of some of Trump’s critics on the other hand may just take us over the brink into the abyss. 7. https://www.informationclearinghouse.info/49886.htm Israel Shamir is an Israeli citizen and not without ardent enemies among his countrymen! https://www.theatlantic.com/politics/archive/2018/07/putins-big-tell/565460/ The two articles reveal diametrically opposed spins on the same topic. I leave it to the reader to choose, which more closely approximates to reality! The Atlantic rates as ‘left-leaning’ in the US political spectrum. This entry was posted in Global Governance and tagged Council on Foreign Relations, Helsinki summit 2018, Human Survival Project, John Hallam, NATO break-up, NATO summit 2018, People for Nuclear Disarmament, PND, Russophobia consequences, Trump Putin relations, US media corruption, Washington war-party. “Theoretically, journalism is meant to help create an informed populace and hold power to account. That’s why it’s the only profession explicitly named in the United States Constitution, and why freedom of the press has enjoyed such constitutional protections throughout US history. The press today is failing to protect Julian Assange because it has no intention of creating an informed populace or holding power to account. Thankfully there is the odd reporter left in the western world that has the courage and the fortitude to challenge TPTB and their captive presstitute media… Robert Fisk is very much in this category and in taking this stand most certainly risks his life. facts [Assange] ,that the public desperately needs to hear, is feared and avoided so much.